So writes veteran Tony and Emmy Award-winning actress and wildlife activist Jane Alexander in the Prologue to her second memoir Wild Things, Wild Places: Adventurous Tales of Wildlife and Conservation on Planet Earth. In an intimate and eloquent personal account of her world travels exploring the wealth of biodiversity our planet has to offer, Alexander shares her joy in the wild while reminding us of the speed and extent of ongoing anthropogenic environmental degradation. 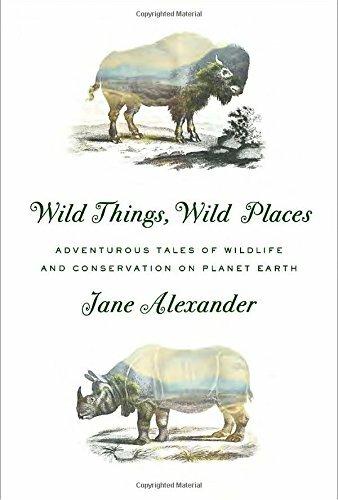 As such, Alexander’s memoir of her explorations of far-flung places is as much a celebration of dedicated field scientists and other conservationists fighting to protect endangered species as it is a chronicle of the animals and birds (mainly birds) that she has sighted over the years. An ardent birder since her youth growing up near Boston, Alexander took full advantage of the exotic locations where she worked as an actor by tagging on nature expeditions with her field biologist friends and local guides. She also traveled extensively as chair of the National Endowment for the Arts in the 1990s and during her service as a Wildlife Conservation Society Trustee, a New York State Parks commissioner and an Audubon Society board member. The lady may not be an academic, but she has certainly earned her conservation street creds. Her book is organized loosely into three parts. The first part, Tiger Man, follows her close friend, wildlife biologist Alan Rabinowitz from his struggles to establish the world’s first jaguar preserve in Belize in the early 1980s. Later she visits his Clouded Leopard study site in Thailand, joins a family trek in Nepal, accompanies him as he observes Bengal Tiger reserves in India, and gets up close and personal with majestic jaguars in Brazil. Alexander is moved to her core by the magnificence of the animals and birds she encounters and the perfection of their adaptations to their natural settings. The downside of this obsession is Alexander’s gut-wrenching anguish about the wanton waste of this natural beauty in senseless slaughters for the illegal wildlife trade. The second part of the book, Wildlife Woman, is more of a memoir about Alexander’s lifelong love of birds and her dedication to protecting their habitat, including the indigenous peoples who live in harmony with them, via her engagement with wildlife conservation agencies. Here the conservation thread is rather loosely sustained between chapters on locales as dispararate as Papua New Guinea, Galapagos, Madagascar, Peru, Amazonia, East Africa, Newfoundland and Hawaii. So this section reads more like a set of random postcards from places she has been about birds she has seen. The third part, Body of the Earth, is more introspective, tracing how Alexander came to feel so passionately about the wonders of nature and the imperative of preserving them as we cannot fully care for ourselves unless we learn to care for the earthly body we inhabit. She takes us to extreme places, like the blistering Sonorant Desert, where climate change and human misuse of the earth are degrading environments, perhaps irreversibly. She tries to find silver linings in the work of innovative thinkers, dedicated conservationists and other environmental mitigators. For example, California already generates about a third of its energy from wind and water and is currently making a big solar push. But fracking for gas continues in many countries despite devastating repercussions deep in the earth’s mantle and downplayed surface impacts on human and animal health. And critical indicator species like the honeybee are in crisis most likely from widespread pesticide use. The book concludes with a list of national and international organizations dedicated to the conservation of the wild, whose goals, principles and missions Alexander particularly supports. Overall, Wild Things: Wild Places is an eclectic, engaging and thoughtful travel diary about the state of the world’s wildlife written by an author who loves and reveres nature and all its creatures, great and small. The writing is brisk and straightforward, conveying the gist of key environmental issues succinctly, without drowning the lay reader in facts and figures, while the presentation is enhanced by some stunning color photographs. However, the fractured format with short chapters flitting around from place to place, militates against a sustained read. The plus is that it can be read in short bursts on the run without losing track. Though the book may appeal most to avid birders, who will no doubt flock to one of their own, there is something for everyone who enjoys a wide-ranging travelogue written by an interesting, open-minded empathetic person with a clear message. “We are in this together” as just one of myriad interdependent life forms in our Noah’s Ark which is planet Earth. Readers wanting an autobiography of Jane Alexander, stage, film and television actor, will find little for them here. But Wild Things, Wild Places is a buffet for those who might enjoy sharing a personal retrospective on the natural wonders of this world from an author who has used her stardom to raise awareness of the imperative of reducing the massive environmental footprint of our species.